Cooking our own on the grill. Photos by Judi Curry. We had a very interesting and enjoyable dinner last night as we celebrated my grandson Cody’s 29th birthday, along with nine of his friends and family. Cody is the adventuresome member of the family when it comes to dining, in spite of the fact that he is a skipper on the New Seaforth fishing boat and does not eat fish. He had suggested that we go to “Buga’s” for his dinner, and it was a first time for all of us. The restaurant is large but we had a private room. For the ten of us we sat five on either side of the table, and there were two grills in the center of the table and we grilled our own. 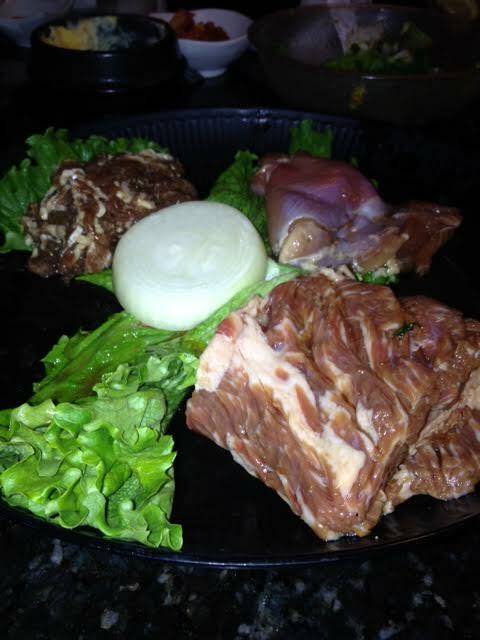 (This is typical of Korean BBQ restaurants.) To say that the menu was overwhelming would put it mildly. (Probably the only thing “mild” on the menu. What we didn’t understand was that the beginning of the menu section was what we would call appetizers. When the waitress was asked if it that was what it was she said “no”. In retrospect, it really was. Most of us ordered something different. For example, I really liked pickled tongue, and when I saw “sliced tongue” on the menu I thought that I would be getting sliced tongue on a plate put in front of me. What really happened was that two large plates of thinly sliced tongue was brought to each of the grills, and we grilled them ourselves. Although tasty, (no pun meant), it did not taste like the tongue I was used to having as a child. 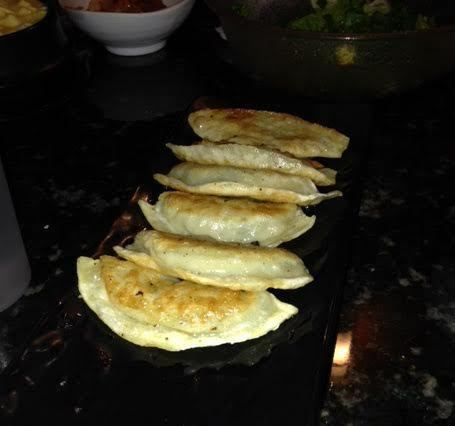 An order of pot stickers was ordered, and these were also served on a long plate for everyone to sample. 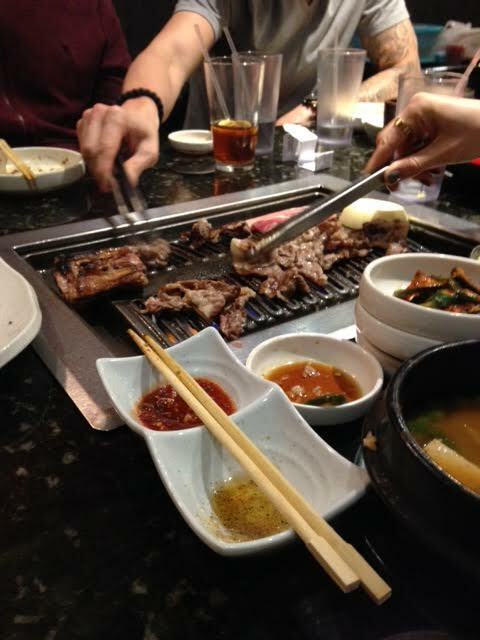 Two couples ordered Combination A for two people, and it had chicken, pork, and beef to be cooked on the grill. There was also one large piece of onion. Those partaking of this combination said it tasty, but the beef was fatty and they did not want to take home the leftovers. Another of the couples ordered from the menu what they thought was a kimchi vegetarian dish. It was made with tofu and vegetables. What a surprise they had when it was set before them, because there were a lot of veggies, and a fair amount of tofu, but it also included meat. They talked to the waitress and even though she was very sympathetic, she did not understand English very well, and when a second dish was brought to them it also had meat in it. They returned that also and the third dish brought to them had no meat. If you were going to eat there and are a vegetarian, I would suggest that you make sure that you communicate that to your waitperson . Still another couple ordered a combo for two people, and we were finished with our meal before it was delivered to them. They repeatedly asked about it, but, again, their request was not understood, and we all waited for them to finish before we left the restaurant. One of the more interesting things was that after we put our food on the grill, our waitperson came over with a scissors to cut the chicken and beef into small pieces. (Wish I had sharp scissors like that.) It was certainly different. And when we were seated at the table, we couldn’t help but notice that the soup spoons were all covered in their own individual paper cover. A nice touch. 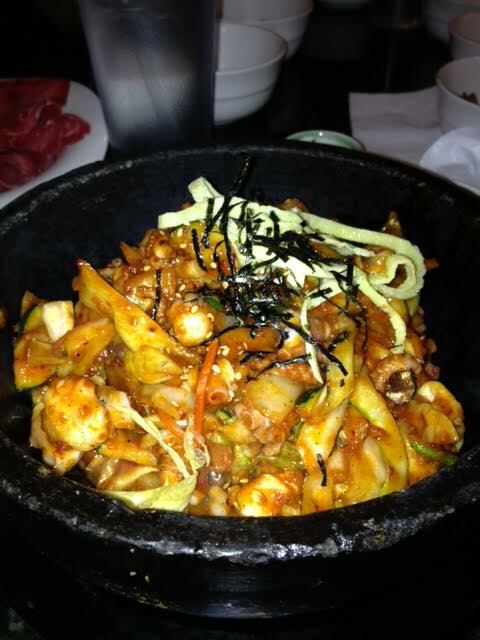 I originally ordered an octopus/abalone soup in addition to the tongue, but the waitress told me it was very spicy. 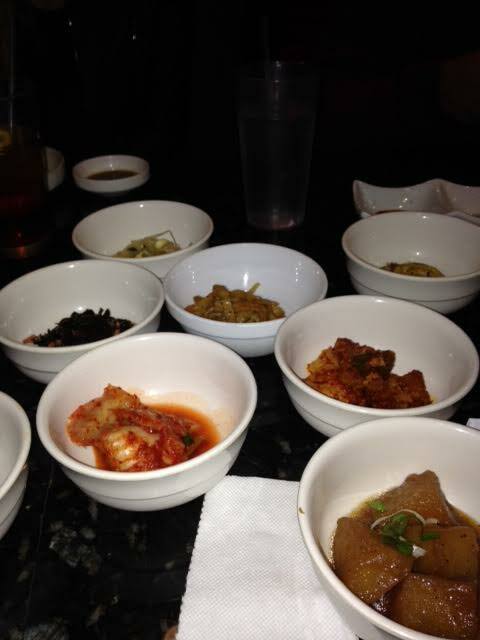 “Korean spicy” was how she put it. Instead, I had what I thought was going to be an octopus soup but it turned out to be was octopus in a vegetable sauce over rice. It was tasty, but the octopus was hard to chew in spite of being cut in small pieces. Combination A for two people with chicken, pork, and beef to be cooked on the grill along with one large piece of onion. The table was replete with many different condiments; spicy sauces; potatoes; salad, etc. Rice was served in silver bowls that had tops on them to keep the rice warm. Although I heard that tea was served automatically at the beginning of the meal, we were not offered tea unless we asked for it. The end of the meal came with a cold cinnamon tea that was nice, but a little cloying from the sugar content. 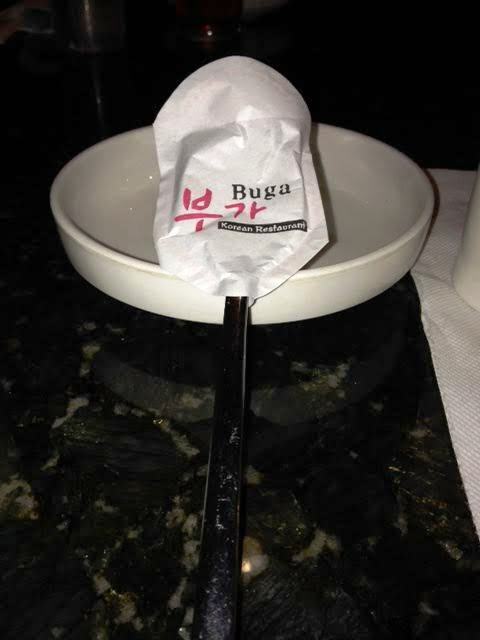 It is interesting to note that the menu is posted on their website – bugabbq.com . It is all in pictures (with names) but it does not tell what is in each of the meals. There is a wide price range but I am not sure just what is an “appetizer” and what is a full meal. The food was, for the most part, tasty and the experience was fun. But I have been to other Korean BBQ restaurants and enjoyed them more than this one. I think that had our server been able to understand us better – or had we been able to understand her better – the meal might have been more enjoyable. Would I go back there? Probably not, since there are other Korean BBQ restaurants in San Diego. But the experience was a nice one; and except for being cold most of the meal, the small dining room was nice and intimate.